From the 1st April 2019, Lindsay Birley began a transition from CEO Asia Pacific, to Global Chief Strategy Officer. This is an important development, as it means he will focus on global carrier development and product development, driving top line sales for franchisees. Lindsay has been instrumental in leading first the Australian operation then the Asia Pacific business, through a period of significant change and growth. He will continue to be based in Brisbane and work alongside the management team in Asia Pacific as part of his new role. Marcel Lal was appointed to the position of CEO Asia Pacific on the same day. Marcel joined InXpress fifteen months ago as Country Manager for Australia & New Zealand and has implemented a number of key initiatives that have seen growth in the business, as well as laying strong foundations for the future. In 2018 Australia’s top line revenue grew by 24% and franchisee margin increased by 25% from $5.9m AUD to $7.4m AUD. In his new role, Marcel is tasked with growing the entire Asia Pacific operations, building on Australia’s results. Marcel has considerable experience in franchising, sales in a number of industries, marketing, partnership and other management functions, which will benefit InXpress franchisees, right across Asia Pacific. He will also be joining the Global Strategy Board to work on the strategic planning for the global InXpress family. Finally, James Buck has replaced Marcel as the new Country Manager for Australia & New Zealand. He will be reporting to Marcel. James comes with extensive experience in the logistics industry having worked at Maersk, Agility Logistics and more recently as the General Manager at Americold Logistics and AM Logistics. His strongest skill is in driving sales, which he has evidenced at every organisation he has worked for. Throughout his career James has worked through numerous sales roles before taking on General Manager roles. He will be a great asset to the Australian and New Zealand franchisees. Whilst many of these changes relate to InXpress Asia Pacific, the impact on InXpress global, including here in the UK, means a strengthening of the network, and new initiatives for our franchisees. This is an exciting time to be part of the InXpress franchise. Discover more about joining this global franchise here! Celebrating our 20th anniversary couldn’t be any better than securing a place among some of franchising’s elite. In February, the shortlist for bfa HSBC Franchisor awards were announced, and InXpress are delighted to be a finalist for Franchisor of the Year, 2019. InXpress believes in delivering the best for both franchisees and our customers; a culture the franchise network has bought into. Together, they aim to remain the UK’s number one consultant for express courier services, and the largest franchisor of worldwide express parcel delivery. This accolade comes hot on the heels of InXpress leaping into the Elite Franchise 100’s Top 10, at the end of 2018. Elite Franchise have just announced their top 100 franchises in the UK, and InXpress has successfully risen up the ranks, in dramatic fashion, to claim their place in the Top 10. InXpress, one of the world’s largest shipping franchisors, offer customers world-class global express shipping services. Since starting in 1999, they have risen to become the number one consultant for express courier services in the UK, and have expanded their network across the world into 14 countries Including America, Australia, India, and, more recently Germany. Using the InXpress business model, franchisees are successfully building strong businesses for themselves, and aspire to attain inter-network accolades, such as joining the InXpress Quarter and Half Million Clubs”, and “InXpress Top Gun” – the top 5 performing franchisees and the top 5 fastest-growing franchisees in the UK, and globally. InXpress are expanding into more and more countries each year. As the network grows, the brand, becomes more determined to improve on their own performance, each year. The Elite Franchise Top 100 identifies the best franchise brands in the UK, and ranks them based on the growth of the network, franchisee support and training, financial performance, heritage and longevity, and community contribution, as well as on innovative developments. So this year, to have risen in the Elite Top 100, from 29th place last year, to 10th place this year, is an impressive achievement, and a clear demonstration of the way InXpress have been developing their business opportunity. On Thursday 4th October, Glasgow's top businesses, organisations and individuals were honoured at The Glasgow Business Awards 2018 at the Hilton Glasgow. The sold out gala dinner and awards ceremony, hosted by Scottish Comedian, Fred MacAulay, saw one of InXpress Paisley’s customers receive recognition in not one, but two of the 16 categories, including the overall winner category. “It was lovely to see my customer, Renewable Parts, winning both the Most Outstanding Business Award, alongside their Innovation in Business award.” Enthuses Steve Abbott, owner of the InXpress business which has been supporting Renewable Parts with their shipping needs on a daily basis. “Steve and the InXpress team help us get our Wind Turbine parts and consumables to our customers quickly and efficiently,” agrees Fred Pullar, Operations Director of Renewable Parts. “Accessing services from carriers such as UPS, TNT and DHL via a simple booking tool saves us time and hassle and is great value. As a result, Renewable Parts have grown in confidence with the services Steve provides, and have doubled the number of packages they ship through InXpress since starting in January. On Friday 5th October, InXpress were awarded the Franchise Marketing Award Best Online Marketing Campaign. This was based on a combination of online campaigns we targeted over 2017, designed to extend our reach beyond our already established followers. The “What if I told you…” online advert, featuring Ryan Reynolds Shaun Birley from InXpress Australia. Have you seen it yet? If not, click here to see it for yourself. And our targeted Young Guns campaign on Instagram, which features some of our Global InXpress Young Guns. This campaign highlights the benefits of franchising for graduates & under 30s. Winning the Network Contribution Franchisee Award, at this year’s bfa awards, means a lot to Neil Hatt. He’s InXpress’ biggest supporter and believes the win was not only for him but for the entire InXpress network. Neil bought his InXpress franchise in 2006 and hasn’t looked back since, “I think franchising suits me so well because I have a big fear of failure. I think to be a true entrepreneur you’ve got to have no fear. Whereas with franchising, you’re always trying to get better but if you stay within the system then it works, so I can be successful within the framework.” The determination to make his franchise successful has definitely paid off. 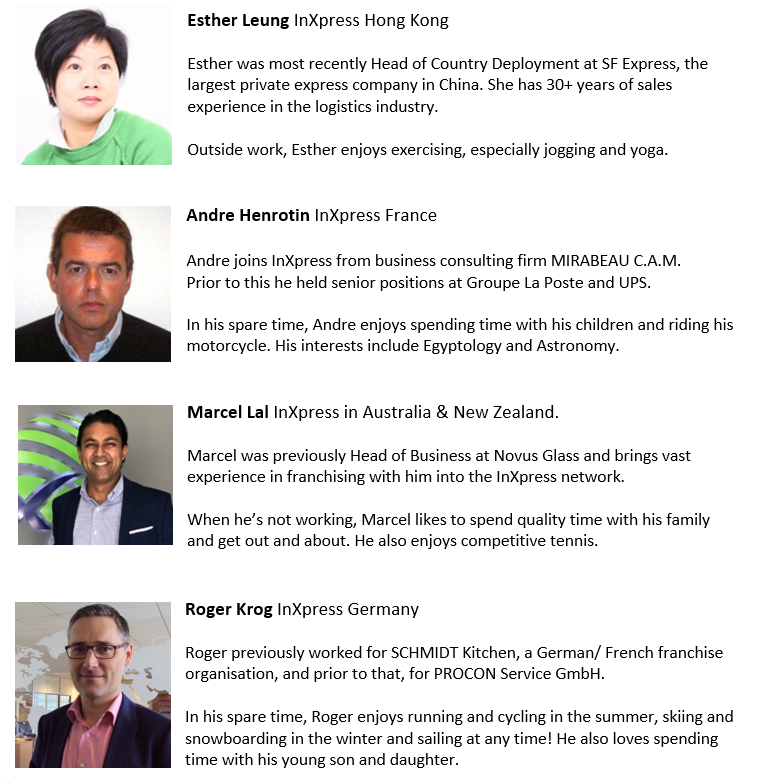 InXpress, one of the world’s largest franchisors of worldwide express parcel delivery and transportation services, have experienced a strong start to the year, having just recruited four new Country Managers to help InXpress Global develop and expand operations further. This is a very exciting time for InXpress globally, as their rapid but stable growth continues with the expansion of operations in Hong Kong, France, Australia and Germany. Based in Hong Kong, France, Australia & New Zealand and Germany, each Country Manager brings with them a wealth of experience of franchise business development, and we are excited about how this will take shape in the coming months and years! Rebecca had an amazing 2017, full of great successes with her franchise business, and fundraising for EYESeeMe. Being announced as one of the finalist for the NatWest EWIF Award for Inspirational Woman of The Year 2018, sponsored by What Franchise, tops off an incredible year. As a self-confessed humanitarian, Rebecca is motivated by people and the desire for them to reach their goals. Everything Rebecca does, her heart and soul are immersed in. This worked well for her business, as she focused on developing the attention to customer service that InXpress are known for. It also meant she was a firm advocate and supporter of the ‘InXpress Gives Back’ initiative, where franchisees are encouraged to find ways to give back to people in their community, or on a more global level. Inspired by a documentary about women and children born into poverty, Rebecca wanted to make a difference. The growth of her InXpress business, particularly over the last few years, has allowed her to dedicate more of her time to helping others, and so the idea of a new charity was formulated with the aim of helping to educate children, and provide essential healthcare for them and women in the poorest, most rural places. Rebecca introduced EYESeeMe to the InXpress network, and the franchisees supported her from the offset. Creating a ‘Penny per Shipment’ campaign: InXpress pledged to donate 1p from every shipment booked through every franchise, through November. The total raised was over £2,000, enough to support 71 children with an education in Thailand! Huge congratulations, and good luck Rebecca – you’re a true inspiration! The British Franchise Association (bfa) has been supporting the franchise industry for over 40 years. Their annual awards event is a fiercely competitive and hotly contended part of the franchise industry’s year. This year, InXpress UK nominated their Birmingham South franchisee, Neil Hatt, for his outstanding contribution to the InXpress network. So, it with pleasure we can announce Neil has been shortlisted by the bfa for this year’s Franchisee Network Contribution award! As a franchise, we are so appreciative of all he has achieved for his own business, as well as for the wider network – he regularly mentors and inspires other franchisees within the InXpress family to achieve greatness for themselves. Neil isn’t just satisfied with achieving great results for his own business, he also relishes the opportunity to invest in other people and see them elevated above mediocre. For example, not only does Neil achieve Top Gun status for his business, he also has helped two of his mentees – new InXpress business owners – to also reach the InXpress Top Guns list! The Top Guns list is reserved for the top five franchisees, based on either being the highest margin-producing, or fastest growing franchises for the year.